We all have our favorite camping meals, but this cookbook provides some fresh takes on camping classics and new ideas to keep camper bellies happy! A new cookbook from the brand that is the authority on the best camping experiences delivers the ultimate guide for creating wow-worthy campsite meals. As you'd expect from the experts at Coleman, The Outdoor Adventure Cookbook is both useful and beautiful. 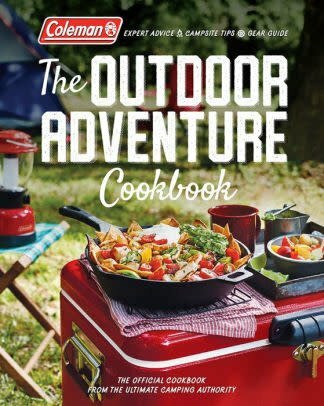 It's filled with 100 delicious campsite recipes that are easy to prepare, using some simple but innovative cooking techniques that will take your outdoor meals to the next level. It includes hearty breakfasts, portable snacks, drinks and appetizers, satisfying sandwiches and salads, hot main dishes, side dishes, and sweet desserts that use familiar ingredients and minimal tools to keep your packing list as short as possible. Since no camping trip is complete without s'mores, you'll find those endearing flavors in S'mores French Toast Sandwiches. You'll also discover new twists on classic camp favorites with Homemade Sriracha Beef Jerky and Loaded Mac and Cheese Bowls as well as some unexpected new options, including Mexican Street Corn Salad and Grilled Brussels Sprouts Salad with Bacon and Cider Vinaigrette. There's also plenty of essential camping information, including menu and packing guidance, expert camping tips, and equipment advice. Whether you are planning a picnic or heading into the wild, you'll find all you need to make your next camping trip unforgettable.